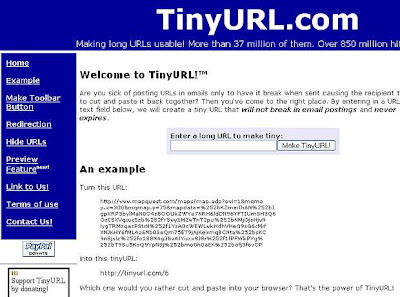 TinyUrl.com , as name suggests, it's one of a site to make long named URL link to short neat form. There is a recent addition to this site. "Preview Feature". Preview feature will enable us to check where that Short URL will take us to. Before, we really don't have any idea, unless we click and check ourself the link. This "Preview Feature" will act like a TORCH LIGHT in pitch Dark Night. We know there are lots of zombie sites, which upon just visiting, may get us into trouble. For security reasons too, this step of TINYURL.COM is very much appreciable. But in browser's address bar, i'll type "http://preview.tinyurl.com/2hpdq9" and ENTER. Note that 'preview' prefix just before the tinyurl.com/.... That's the magic. And the next page will lead us to the actual link. When we do that 'preview', if we don't see the page we desired, then it's because, we've not enabled the preview feature. Enabling it is as easy as cakewalk. Just click the link called " Click here to enable previews" and you are done. And, when we create TinyUrl, we will be given one more option, that's preview Options of our TinyUrl link. The safest bet TinyURL could offer. If you like this, clicking on their GoogleAdsense would be as good as a donation. I did that.